Although it is only 70 miles across the Cook Strait (the stretch of water that separates North and South Islands) from ‘windy Wellington’, the city of Nelson has a noticeably more pleasant climate than New Zealand’s capital. It is the gateway to the stunning Abel Tasman National Park, and also has a prominent fishing and seafood industry. 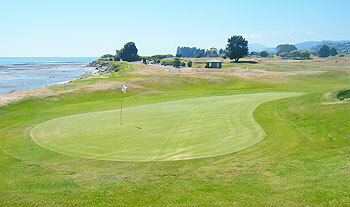 It is also home to one of the better links courses in New Zealand. After a brief spell with a 9-hole set up nearby (in 1901), Nelson Golf Club moved to a new links course in 1905, occupying essentially the same space as the current routing. World War II interrupted play for a few years (the course was used as an RNZAF base), but in 1945, golf was back, initially as another 9-holer, and then swiftly extended to an 18-hole layout in 1948. Planes still feature heavily, with the 7th green being only 70m from Nelson’s runway, although do not be discouraged – this is far from being Heathrow or JFK. The course has been gradually evolving, and in recent years over 450 trees have been felled, revealing a more traditional links layout that was obscured by the foliage for years. In keeping with this restoration work, there are around twenty extra bunkers, and almost every trap on the course has been converted to have Scottish-style revetted faces – many of them are now devilish pot bunkers. Standout holes include the par three 6th, which hugs the shoreline, playing to a kidney-shaped green, and the two-shot 7th, arcing left, with its green cut into the dunes. Nelson Golf Club has hosted NZ Amateur Championships for both men and women in the past, most recently in 2014. There has been a lot of work done over the last 4-5 years at Nelson. LOTS of trees came out about 5 years ago, and to preserve the challenge, around twenty new bunkers have been added, and almost every bunker (old and new) now has steep revetted faces. And I think it’s resulted in some significant improvement. I don’t know why a links course would want to be covered in trees anyway, there’s just no need to play golf down a tree-lined avenue when the ground affords you so much scope for variety and strategy. Some of the new bunkering is very astute. I was playing with a Tasman rep, who said that when he used to stand on the 12th tee, he just pulled driver. Now, with the addition of two fairway bunkers, he has to think about it. Isn’t that proof that they’re in the right places? Good to see some centreline bunkers too (on 11) There’s also two huge new wasteland areas (on the right, off the 4th and 5th tees) that for me work very nicely in banishing the memory of those trees. Hi Matt, Thanks for your review of our course, in the main I thought it came out well. I was surprised at your comment of 3 dull short holes though, which I presume were 3, 15 & 17, but they seem to hold difficulty for our members. I wondered if you played off the front or back tees? That would certainly make a difference. Thanks again, Derek. I played a lot here as a junior with my grandad who was a member for years. Was horrified by the changes. Look, I understand the likes of this reviewer who hates tree lined courses, but there's a reason for the trees - SHADE and SHELTER. The course at Nelson is in probably the most exposed location imaginable in the whole of the Nelson province. Spending 4 hrs on the course in the direct Nelson sun and inevitable wind is just not fun. Speaking to some locals they were saying that membership at the nearby Motueka Golf Club (tree lined links) had increased significantly in the last few years as many former Nelson members are playing there.